Posted on Mon, Oct 31, 2011 : 12:30 p.m.
Brady Hoke and the Michigan football team play their next two games (Iowa, Illinois) on the road. Michigan is off to Iowa, where the Hawkeyes average 39.2 points a game at home. Off to Iowa, to face a team coming off a 22-21 road loss to Minnesota. Odds are Michigan football coach Brady Hoke will talk more today about the high-scoring Iowa team than the one that lost Saturday to gave Minnesota its first Big Ten Conference victory of the season. Michigan, (7-1, 3-1 Big Ten) ranked No. 13 in the polls and No. 15 in the latest BCS standings, is at Iowa (5-3, 2-2) on Saturday (Noon, ESPN). Hoke will face questions about Legends Division rival Iowa, road games, injuries, the emergence of Fitz Toussaint as a featured running back and more when the press conference begins at 12:30 p.m. We'll provide updates throughout the press conference in this article. Brady Hoke: On Iowa's pink locker room. "Who am I to judge?" Brady Hoke: On Iowa losing to Minnesota. "Minnesota is a heck of a lot better now than they were." Brady Hoke: Said Stephen Hopkins has moved ahead of John McColgan at fullback based on play, not injury. Brady Hoke: On if he'll keep Taylor Lewan out of practice. "We don't have that luxury. ... Our depth at offensive line is probably as low as I've ever seen at a university." Brady Hoke: "I thought we got off blocks well and got to the football well." Brady Hoke: Said on the play where Denard Robinson took a knee on an offsides, "I think that's some old training." Said he'd rather see him take a free shot down field. Brady Hoke: On starting this many freshman. "The best players have to play. ... Or else you're cheating the program." Brady Hoke: Said he thinks Fitz Toussaint is the definitive No. 1 running back. "He's earned that." Brady Hoke: On Desmond Morgan. "He would have played more a lot sooner, but he aggravated a hamstring at the end of training camp." Brady Hoke: "Ricky (Barnum) is day-to-day. ... Taylor (Lewan) is fine." Brady Hoke: On Fitz Toussaint. "The most exciting thing was his burst. ... He's a guy that will get starts again for us. ... Vince (Smith) was a little beat up so he didn't get as many opportunities." Brady Hoke: "I don't know if our blueprint is ever going to be any different," on playing games in October and November. Brady Hoke: "I've always loved as a coach watching Iowa on offense and watching Iowa on defense." Hoke said if he's playing a common opponent, the Iowa tape is the first tape he'll watch because Iowa's physicality gets him excited. "It's awesome." Brady Hoke: Doesn't remember having a team that creates turnovers at this rate. Brady Hoke: Of giving up the team's first touchdown of 40 yards or more against Purdue. "They caught us in a blitz. It was a great call by them, not a great reaction by us." Brady Hoke: "Not getting in, scoring a touchdown before half time, bothers me." Brady Hoke: "(Jordan Kovacs) ran around and did things last night." Brady Hoke: Said Jordan Kovacs is "day-to-day." Brady Hoke: "Mike (Martin) no question was a factor in the game. ... I thought Desmond (Morgan) and Kenny (Demens) played well." Brady Hoke: "When you get into November you play for championships in the Big Ten conference." Brady Hoke: "They (Iowa) play very well and are a very well coached football team. ... It'll be our most physical game to this point." Ryan Van Bergen: On pink locker rooms at Iowa. "I like the pink locker rooms. ... I think more teams should do it. It's better than the off-white jail cell look." Ryan Van Bergen: "We're very proud of where we are, but we're nowhere near where we want to be." Ryan Van Bergen: Said he doesn't think playing defense changes much on the road. Said the crowd noise is less, and it's easier to communicate. Offense is where you expect some communication issues. Ryan Van Bergen: On Mike Martin, "Good luck to the guard that has to block him one-on-one. ... I don't think there's a player in the Big Ten that can block him one-on-one." Ryan Van Bergen: "It seems like the buzz around Michigan in the defense is back. ... We want to come come to the podium on Monday and say we played perfect, and we're not there." Ryan Van Bergen: On J.T. Floyd. "No one pushes J.T. as hard as J.T. pushes J.T." Ryan Van Bergen: On Minnesota beating Iowa. "Records go out the window in rivalry games. ... Minnesota is a better team than when we played them." Ryan Van Bergen: On Jake Ryan. "Jake has done a great job of continuing to be better regardless of winning his spot out of camp." Ryan Van Bergen: On Jordan Kovacs not playing. "He probably could have played, but it wasn't in his own self interest." Said he thinks Kovacs will play this play this week. Ryan Van Bergen: "No team is the same team that they were in their opener. ... Now it comes down to if you win all your games in November, you've got a good chance to be in the Big Ten championship." Ryan Van Bergen: On the defense. "We're almost to where we want to be." Tue, Nov 1, 2011 : 5:20 p.m.
Mon, Oct 31, 2011 : 10:02 p.m.
Mon, Oct 31, 2011 : 7:19 p.m.
Mon, Oct 31, 2011 : 7:08 p.m.
Iowa is a winnable game. Michigan has to come prepared to play solid, mistake-free football. I'm worried about Taylor Lewan. The guy is a beast on the left side of the line. Hoke: &quot;Our depth at offensive line is probably as low as I've ever seen at a university.&quot; Ouch. That's about as close to a rebuke of the former regime as you'll hear from Hoke. Still ... ouch. 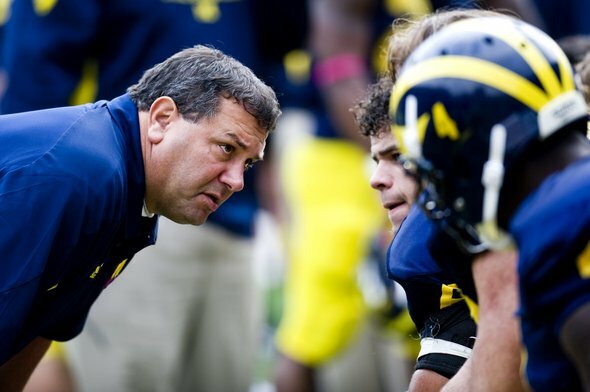 Mon, Oct 31, 2011 : 8:19 p.m.
What about this one.... Brady Hoke: Said on the play where Denard Robinson took a knee on an offsides, &quot;I think that's some old training.&quot; Said he'd rather see him take a free shot down field. ZING!!! Mon, Oct 31, 2011 : 6:44 p.m. Unfortunately, there aren't yet any preview analyses out there for MI vs IA. All Google hits were for 2009 and 2010. But from here it looks like Michigan (BCS #15) will REALLY leave the hapless Hawkeyes (Unranked) depressed by supper time this coming Saturday. All the Maize &amp; Blue has to do is to continue / maintain their current level (means: not have a letdown). I think Hoke is purposely over-stating his regard for Iowa. They may play tough but they don't have the manpower or talent that Michigan will bring to this game. Downside: winning won't give Michigan another boost in the standings, but that too indicates Iowa is the underdog. Upside: one more win just builds confidence and will help keep the Wolverines on track to more improvements. Also worth noting: a win vs. Iowa gives the Wolverines a 8-1 overall record, and they'll be 4-1 in conference play. Remember these two stats: both put Hoke convincingly past the Former Temp. Coach whose initials can be seen at every railroad crossing. Mon, Oct 31, 2011 : 9:06 p.m. I think that Hoke is an honest straight spoken man who is very careful and clear with his statements. I take his comments about Iowa at face value. Purdue was a good win. It was earned and showed both quality and flaws in this team. For the rest of this season we must take no game for granted. If we don't play our best, or near our best, we can and probably will be beaten. WInning convincingly on the road is the next step in demonstrating that the team has put the collapse of the previous three seasons behind them. So let's not count our chickens until after they hatch. Mon, Oct 31, 2011 : 6:36 p.m.
Van Bergen certainly is a polished, effective spokesperson for the team. Very impressive, perhaps reflective of his sociology major. Kudos for apparently having become the &quot;official spokesman for the Michigan football players.&quot; That having been said, it sure would be nice to hear from more of the other players. Mon, Oct 31, 2011 : 6:24 p.m.
A good tough win on the road at Iowa would speak volumes. I believe we can match the toughness. especially with Hopkins named starting fullback, At first I was more of a McColgan fan, but after watching Hopkins block well against purdue out of the I formation, I am on board. If we can retain this downhill identity we can win. HOWEVER We WILL lose if we get too carried away with lofty play calling and goofy packages. we need to play honest football against Iowa. No broken plays. No super trickery. (although i did like the end around using denard as a decoy) Fitz needs touches early and often. whoever can execute powers, options, traps and screens will win this football game. Im also excited for our D to play a tough offense in Iowa. this game will be a sneak peak of our teams soul that will have to emerge against Nebraska and OSU. ball security will also be important, as the margin of error decreases while @Iowa. Mon, Oct 31, 2011 : 6:13 p.m.
El Meanador El Meanador i am amazed how wise you are!!! happy MEANday to you also! Mon, Oct 31, 2011 : 5:54 p.m. Happy MEAN day! 1.Beat Purdunck---very winnable game . CHECK!!!! 2. Slap the Squackeyes! !-----It's time for big blue to do the hokey-pokey at kinnick stadium. (sorry Hayden Frye) 3.Play defense against the Illini----if we hold em under 65--we win! 4.Hook the huskers-welcome to the big house...children of the corn!!! 5. Smush the punkeyes- nothing like kicking an injured dog while he's down-- See Ndamukong Suh 6. Continue to read all of the MEANies posts and marvel at his wisdom and way with the ladies! MEEEEEANchigan football will go 4-0! i was told by a guy that I know!!! Mon, Oct 31, 2011 : 5:11 p.m.
Iowa IS, what msu claims to be. Both physical and well coached. Let's hope that Jordon Kovachs can play...and that this young team stands up to the challenge. One more step, but a major step, toward title number 43! Go Blue! Mon, Oct 31, 2011 : 5:07 p.m.
his second to the last statement says it all............. GO BLUE! !